I bought this old postcard featuring the work of Norwegian artist Theodor Kittelsen (1857-1914) for $1 earlier this year at a postcard show. The vendor I bought it from saw me browsing through the "fairy tale" and "fantasy" postcards and thought, after seeing the price, that I was just looking for something to flip for a profit. "Good luck," he said, taking my dollar. But I was just smitten with the delicate illustration, and I wanted to find out more about what was portrayed on the old, unused postcard, which was published by Enerett Mittet & Co.
Kittelsen is remembered for his illustrations of trolls and other creatures from folklore. 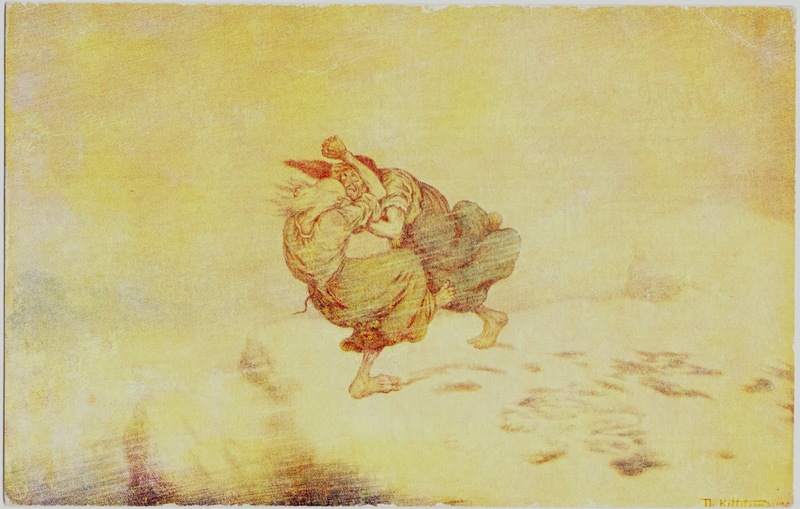 He did the artwork for some of the later editions of Norwegian Folktales by Asbjørnsen and Moe, which is where I first encountered his work. The beauty of the illustration on this postcard becomes even more apparent with a little magnification. The caption on the back of the postcard states: "Th. 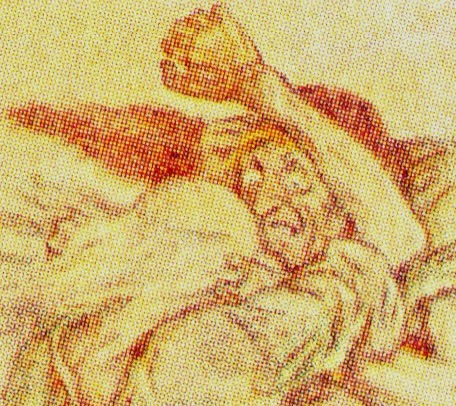 Kittelsen: Trollkjerringer på Norefjell." But I think that a more accurate translation is "Troll Woman." 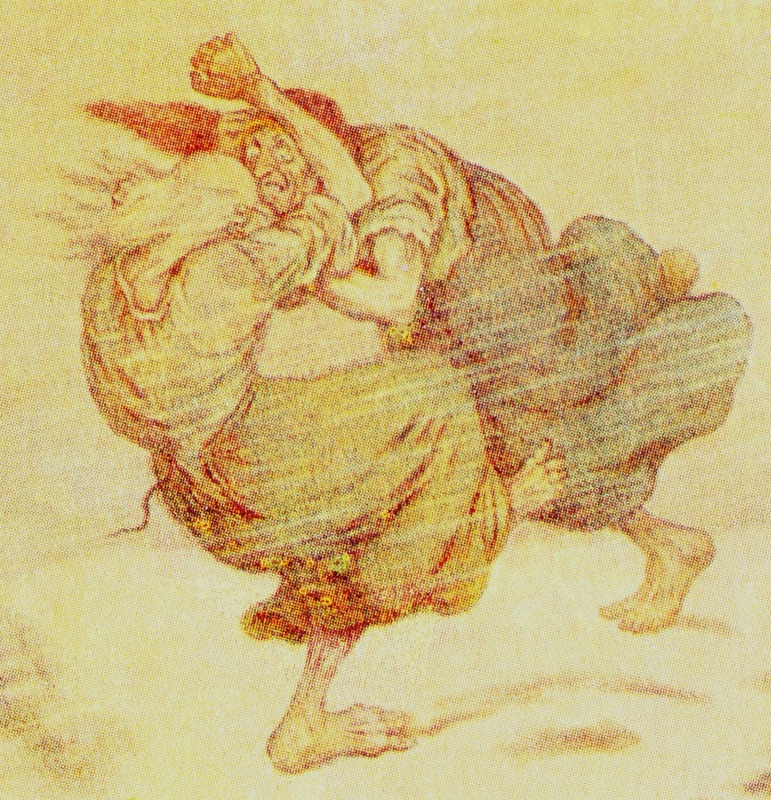 And, in fact, I think these are two Troll Women, fighting during a mountaintop storm. Why are they fighting? I'm not sure we were ever meant to know. To view more of Kittelsen's fabulous folklore artwork, see this Wikipedia gallery and this "Siberian Tribute" to him. I have just finished writing a book for children about a troll girl. May I use this postcard on my website?